Yikes! I’ve missed a few of these. It is -insane- how hectic life gets around here sometimes. There are days when I barely have enough time to breathe, so I really shouldn’t be surprised when a meme goes missing from my rotation. Still and all, I would like to TRY to get these done EVERY SUNDAY! This week, our hosts have e-mailed us about something new. 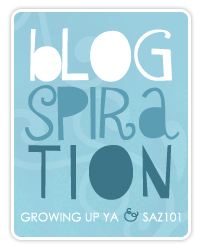 Apparently it’s not going to be an every-Sunday-thing, but an occasional little fun bit of the Blogspiration meme. I’m game! Now, according to the eMail, this can be good, bad, or ugly inspiration. Hmm. Well…I think the book I’ve read most recently that inspired me was probably MWF seeking BFF by Rachel Bertsche. I actually have a review scheduled for this book for Februrary 28th and I anticipate giving it a rather high rating. It’s potentially a book that’s not for everyone – parts of it are a bit dry with a bunch of references to various studies and lots of research – but the ideas in it, the theme of the book, is just…nice. It’s all about getting out there, making friends, socializing, being a happy, smiling, courteous, lovely person. Since I’m “new” in town here in San Jose (ok ok, I’ve lived here since 2008, but still…) and I haven’t really made the effort to go out and meet new (local) friends, the book really struck a chord with me. I should just put myself out there and DO things. I should join some book clubs and I should do the Mommy & Me groups and there’s a few dog events around that my Border Collie would loooove… So yeah, the book has inspired me to look at my options. What book inspires YOU? Leave me a comment and let me know! You should put yourself out their more often. I am happy this book showed you the way. lol. Sorry, that sounded a little too philosophical. But I do like the sound of this book. It seems kind of simple but educational and enlightening. Thanks for sharing. Philosophical can be GOOD! 🙂 Thanks for stopping by! Hi there and thanks for stopping by! I wish I was an extrovert. Really, I do. It’d make so many things so much easier! The funny thing is, if I’m forced into a social situation, I can interact and function just fine – it’s just that I can’t make it happen on my own! Ree, this sounds wonderful. I know what you mean about some books not being for everyone, but I love finding those books that are perfect for US. You know? I’m so glad this has inspired you! I LOVE it! Sarah, you know, I do the same thing. I am nearly always perfectly content to fade into the background and let everyone else do the talking. I’m considered the loud one in my close group of friends, though. It’s crazy weird! Ree!!! First, I am VERY excited to read your review 😀 This book sounds really interesting! It definitely reminds me of the time right after I moved back home after studying away at college. I was friendless. All my high school friends had moved on with their lives and all my college friends were too far away. It was really hard to put myself out there, but you just try and you do it. I’ve made a lot of really great friends since moving back and once you do that it gives you the confidence to go forth and make more. 😀 Thanks for sharing, Ree!! Kristin, you make a really valid point here – I know once I get the momentum, it’ll be so.much.easier! It’s just taking that first step, you know? Maybe I really should sign up for some of those mommy-and-me classes. Eek!